Oak railway sleepers are a great choice when it comes to interior design projects – particularly when used for mixed wood wall creations. Extremely well sought after, railways sleepers can transform your conventional home into a haven that boasts the most stunning aesthetics. Known as the highest grade, with 83% oak material, prime grades will give a clean and uniformed look to your design. This mid-range oak grade can display colour variations and grey patterns – ideal for a mixed wood wall with added interest. The rustic oak grade contains exciting vibrant colour patterns and variations that can add further quirks to the design. Often displaying less colour variation than other oak grades, antique grades are suitable for wood walls that exude character. A combination of the prime and natural grades, millrun possess the best oak characteristics to create a flawless design. Get the right measurements for your project; then cut the wood in accordance with your specifications. Sand each board to make it smooth, especially at each end. To further enhance the ‘mixed’ wall look, apply different mixes of wax staining to each section. When dry, bring all the boards together so you can decide on any additional colour mixes or glaze. Equipped with different panelling nails, you can now start securing the wood to the wall. The key to a harmonious balance is to get the right amount of contrast. You can incorporate dark-stained pieces of furniture with whitewashed elements – to create the feel of a light and airy room. Neutral wood tones can provide a dominant effect in the background, without going off theme. Best achieved through adding two or three similar types of wood tone finishes, these should be applied throughout the design. For the ultimate finish, complement your mixed wood wall with accentuating colours - this can be in the form of ancillary fixtures such as stools, lamp shades and scatter cushions. These elements can help you to achieve continuity throughout the room. 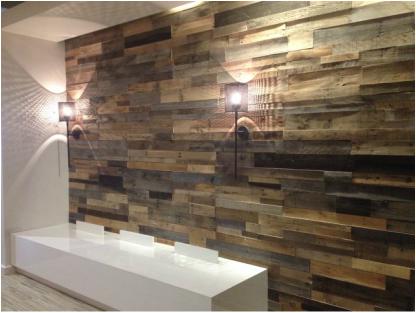 Get creative and start your exciting new wood wall feature with the best reclaimed cheap railway sleepers from Railway Sleeper! Give us a call today on 01536 267107 to discuss your project requirements. Let’s explore the different oak grades:Oak railway sleepers are a great choice when it comes to interior design projects – particularly when used for mixed wood wall creations. Extremely well sought after, railways sleepers can transform your conventional home into a haven that boasts the most stunning aesthetics. · Get the right measurements for your project; then cut the wood in accordance with your specifications. · Sand each board to make it smooth, especially at each end. · To further enhance the ‘mixed’ wall look, apply different mixes of wax staining to each section. · When dry, bring all the boards together so you can decide on any additional colour mixes or glaze. · Equipped with different panelling nails, you can now start securing the wood to the wall.